It's Tea Time! 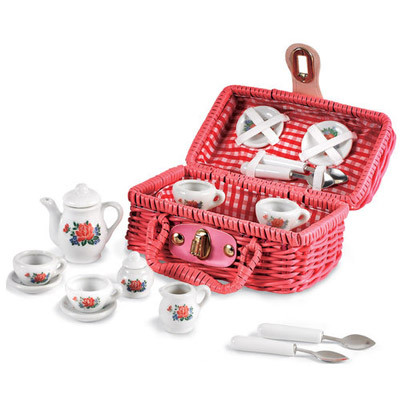 A child's miniature porcelain tea set decorated in pretty, pink roses is neatly packed in a pink, plastic wicker picnic basket with gold tone clasp. Set includes four cups and saucers, four spoons, teapot with lid, creamer, sugar bowl and basket (17 pieces in all). Overall 6½"w, 3½"d, 3"h.